Why Buy Plans from Chesapeake Marine Design? What technical support do I receive after buying Construction Plans? How can I contact other builders? What Skill Level Is Required? What Is The Difference Between Study Plans, Stock Plans, And Full Size Frame Plans? Where Do I Buy Sails? How Long Will It Take and How Much Will It Cost? Good looking - so you can be proud of you hard work. Simple pleasing lines forms the basic foundation for each of our designs. This is a recognized trademark of each design. Simple to build - so the process is as fun as using the boat. Our boat building experience is applied to each design. We think through each construction detail to make sure the boat is buildable. Easy to use - so you have more time to enjoy yourself on and around the water. Our engineering and practical on the water experience become an integral part of each design to ensure maximum performance with amazing simplicity. We achieve these objectives by a combination of experience that has evolved over 30 years of technical education, boat building and boating. If you look closely at many of the design descriptions, you will find boats build by the designer. The lessons learned from this experience are incorporated in each design. Finally, we are so sure you will enjoy building our boats, that we offer a 30 day return policy for construction plans bought online. We look forward to helping you with your next boat building project. When you buy construction plans from Chesapeake Marine Design, we will provide expert support by an experienced boatbuilder/designer. We have talked many of first time builders through the building process. Technical support includes suggestions for material options, powering selection and problem resolution. We encourage you to review the FAQ's on this site and the Construction Booklet "Boatbuilding With Plywood and Epoxy" for construction related questions. If you require more clarification, send your questions via e-mail to karl@cmdboats.com. We will be happy to talk with you on the phone or in person at a prearranged time convenient for both builder and designer. The boats presented in this catalog are within the capabilities of first time builders with a modest amount of woodworking abilities. Basic woodworking skills are recommended including knowledge of wood grain, cutting, planing and fastening (screws). The remaining skill is acquired by experience. The skill level required does depend on the type of boat being considered. Most boats using plywood and straight frames are within the range of most first time builders. The primary difference between boats isn't necessarily skill but time required for the project. For example the WINDWARD and REDWING series boats are glue and screw construction with the same type of structural members. The larger boats have cabins and interiors. So, if you can build a REDWING 18 you can build a REDWING 26 and so on. It will just take more time (and money). We offer Stock Plans of the designs shown in this catalog. Study plans are intended as summary information for review prior to purchase of stock plans and full size frame plans help minimize lofting by the builder. The description of what each plan includes is presented below. Study plans present the arrangement drawing and sail plan for sailboats. Specifications are given along with a discussion on the features of the boat. Hull materials are also presented. This information is enough to help you make an informed decision on the Windward Design you are planning to build. Please call or write if you have specific questions or are considering variations to the design. We are always open to suggestions for modifications and will advise you as to the feasibility of incorporating them into the design and helping you get underway. Construction plans are offered to boatbuilders who feel that an existing design will meet their needs. Contents of the construction plans for the boats in this website vary depending on the design. Each set of plans includes specifications for materials, lines drawing, construction, arrangement and sail plan. Additional sheets are provided for boats that are intended for first time builders and include construction set-up illustration, dimensioned panels for sides and bottom and additional details as required. When you purchase a set of our stock plans you become our client. As a client you are entitled to receive answers to any questions that you may have on the plans that you ordered. We want your project to succeed! Full size frame plans are available for the designs in this catalog. The majority of boats are designed with frames corresponding to dimensioned stations in the lines plan and the table of offsets. This minimizes required lofting that is intimidating too many. We also offer full size frame plans to guide frame construction. An example of a frame plan provided full size is shown to the right. A word about boat plans is in order here. Boat plans are different than for houses etc. because the hulls have a complex 3D curved shape. This 3D shape must be developed in 2D lines drawing or panel layouts. The remaining plans derive their shape from this drawing. Other important measurements are given relative to the hull. Design details are easy to show in the plans for the smaller boats. As the size of the boat increases, so does the number of details that need to be measured, cut, fit, assembled and finished. It is nearly impossible to show all of the details on the plans. This is the subject of boatbuilding books. The execution of the details is easy to figure out as you go along with the aid of a book or another boat to look at. The construction methods for the plywood boats included here are easy to figure out from the plans where panel layouts are provided. I have provided a basic sequence and set up illustrations in the plans intended for first time builders. I have built many of the designs in this catalog and am familiar with the details needed to build them. I am happy to answer questions. So take that first step and begin. Perhaps starting with a small boat to learn on will help you on your way. Even the most difficult boat shown in this catalog can be built with basic hand tools. The primary tools required include a circle saw (with a carbide blade), a hand power plane, drill and belt sander. Larger boats will require industrial grade tools. Remaining tools include saber saw, hand plane, hammer, screw driver, tape measure, palm sander, chisel, clamps (lots) and basic home shop tools. Remember to keep your tools sharp and in good condition. Follow tool manufacture's safety instructions. Wood is used for the majority of boats presented in this website because it is easy to work with, tools are readily available and the material suits the style of boat designs presented. Other materials are possible for the larger boats of panel construction including aluminum and steel. Conversion from one construction method or material to another is possible. Please contact us for additional details if you are contemplating other materials. We will be happy to advise you. Plywood lends itself to simple panel construction. Marine Grade plywood is recommended. Lumber is Fir, Yellow pine, Mahogany or other suitable rot resistant woods that are compatible with epoxy. White Oak and cedar are preferred for traditional plank on frame construction. Mail order suppliers advertize in the wood boat publications. If you have questions about substitutes, call us for recommendations. Epoxy glue is used to join members together. If used correctly this forms a very strong joint that requires few if any mechanical fasteners. Epoxy is also a water impermeable glue used to join members of the hull and as a sealer to encapsulate the wood. This forms a watertight barrier provided all exposed surfaces are covered well. With modern paints applied as top finishes, the boats require no more maintenance than any other material. Epoxy is supplied with pumps that premeasure proper amounts with each stroke. They are easy to use if you follow the few simple directions provided by the suppliers. Construction methods are indicated in the catalog for each boat. Construction techniques used include glue and screw, tack and tape, panel assembly, strip planking, cold molded and plank on frame. Glue and screw construction is assembled on frames and longitudinal members, keel, chines and sheer clamp. Glue and screw construction is similar to tack and tape because epoxy is used in the joints and fiberglass tape is applied to the external exposed edges of the plywood. The combination of epoxy and strategically placed mechanical fasteners forms an extremely strong joint. The boats are generally built upside down on a ladder frame and plywood panels are glued to the structural members. Screws are added strategically for added strength. The glue and screw boats presented in this catalog are easy to build because straight frames are used as the building form. Temporary mold construction is not required. The ladder frame holds the boat in alignment while working on it. This is especially helpful when working alone. Stitch and Glue construction (alternately called tack and tape) uses plywood panels fastened together with fiberglass tape and epoxy filler. This technique often appears attractive to first time builders because it minimizes beveling of frames and adjacent panels. Boats built in this manner are assembled with panels, frames and bulkheads predimensioned in the plans. Panel Construction is a hybrid that I have developed for skiffs that combine the simplicity of tack and tape with the ease of construction and strength of glue and screw. The panels are laid out full size on the plywood and cut. Then the chine is glued to the lower edge of the side. The sides are fastened to the frames and then to the stem and transom. The assembly is turned over and the bottom is but on. This is quick and easy without a lot of filleting and glassing. It looks traditional also. Strip Plank construction is as its name implies wood strips are edge glued and nailed together then fastened to frames, stem, and transom. This construction is suited for round hull forms. It is time consuming and requires hull sanding and faring to achieve a good finished look. Cold molded construction consists of thin layers of wood bent and glued together to form the hull. Set up is similar to glue and screw construction and often applied over longitudinal strips as in strip planking. This process is suitable for round hulls. Several designs in this catalog use 1/4" plywood as the layer material. This is useful for Vee bow shapes below the waterline. Plank on frame construction is a traditional method for building boats. This includes smooth caravel and lapstrake construction. Planking is fastened to bent or sawn frames. Lapstrake is self faring and requires minimal maintenance to keep it looking fair. Construction methods in materials other than wood are possible. If you would like to build a boat in a method or material other than indicated in the catalog, please let us know. We will be happy to advise you on the conversion. The sails for the boats in this catalog are simple in shape and cut. No hi-tech materials are required. There are sailmakers in most regions that are capable of making the sails. All that you need to do is take a copy of the sail plan to a local sailmaker and ask for a quotation. I have worked with SAILRITE in Columbia City, IN. They do fine work for an economical price on kit sails. They have a copy of the sail plans in this catalog and will be happy to provide a quotation. Material cost varies depending on geographic location and availability. The study plans provide a list of material scantlings to give you an idea what materials are recommended. 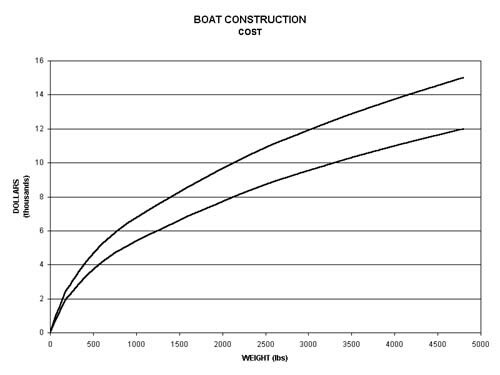 This information can be used to estimate the hull material cost. Trim and outfit costs vary depending on the level of finish desired by the builder. It often pays to contact as many sources as possible to compare. Remember hull materials are a fraction of total cost and substitution of lesser quality material will be a short term saving. Call if you have questions on sources of materials we may be able to give some suggestions and rough costs to help you on your way. 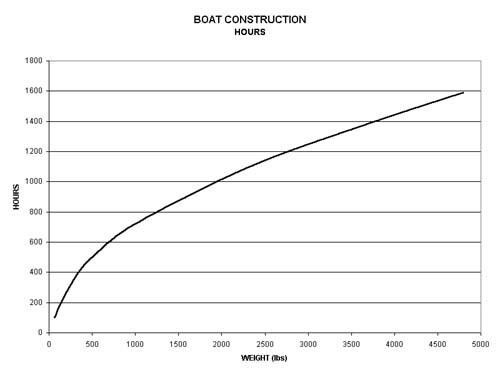 Small Boats - We have included two graphs to give you a rough idea of hours and dollars for most small plywood boats in this website. Two cost curves are shown. The lower curve is for sailboats with a modest rig. The upper curve is for boats with involved rigs and powerboats with a motor. Large Boats - are being built for $4 to $6 per pound for materials and plywood hull. Finished costs by a professional builder are running $4 to $6 per pound depending on the level of outfit and finish. Steel boats are at the lower end of these numbers but again can be more expensive for high end outfitted passage makers.